I once heard a story from Billy Ward that he took a lesson with Elvin Jones on a trip to New York City when he was a kid. 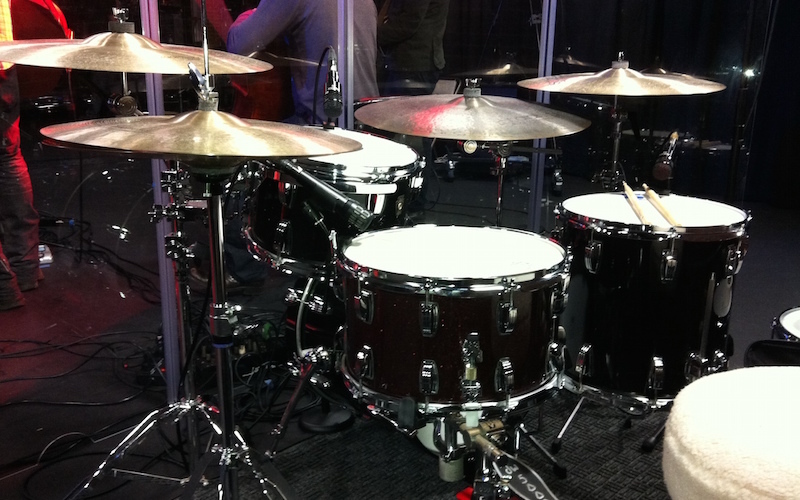 The drum studio had this beat up kit and when Elvin sat down at it and played it, the kit sounded like a million bucks. Moral? It’s NOT the kit, it’s the player. That said, a nice kit sure makes your music making experience more fun and often times, more inspiring. I love drum gear – LOVE IT. As such, I have a fair bit of it kicking around. Of course, what I use depends on the gig, but here’s a list of goodies you might see at a gig or session. I have been part of the Ludwig family of artists for a few years now. Ludwig was my first kit: my dad’s early 70’s Mahogany Cortex Super Classic kit (the jazzette configuration). One thing about endorsements: it’s not about getting free gear, it’s about building and establishing a relationship and proving to each other that you want to help the company and they want to help you. I don’t get stuff for free from Ludwig or any of my other endorsers. But, It’s a real honor to be part of all of their families of artists. These shells harken back to the original Ludwig formula that made them household names. The shells are 3-ply with 1/16″ inner and outer plys of maple with a 1/8″ inner core of poplar. Then, 1/4″ maple reinforcing rings top and bottom finish the job. The bearing edge they put on these drums is more round so more of the head is touching the shell edge. The result? Warm, ‘phat’ tones that project with punchiness and authority, but retain warmth and maintain clarity. This is the classic maple shell that Ludwig has been doing since the 70’s. This 7-ply, 6 mm shell is bright, articulate, and warm. I actually got this kit off of CraigsList when I was waiting for my Legacy kit (see above) to be finished. The sable black finish looks super classy and sounds wonderful at any tuning range. These drums are also super easy to cart around!! White interiors and a virgin 20×14 bass drum. This was an acquisition from Pro Drum in Hollywood. Word is, this was in the back for over 3 years. It was covered over with yellow/gold contact paper. So, when they finally started taking that off and saw the beautiful Black Diamond Pearl finish, they were all surprised. I had been looking for a vintage kit for a while and, while it’s not typically my thing, I went with this kit. You see, I’m not traditionally a big fan of 13″ rack toms. But, it was a great deal and a wonderful finish so I said ‘alright, let’s see.’ I’m glad I did. I lucked into the 12″ rack tom courtesy of my buddy Jimmy Paxson (he had two from the same vintage!). The 14×14 floor tom was an Ebay acquisition and while it was more than I would have liked to spend, I’m glad I did: the drum sounds phenomenal. Add the matching wood snare (5×14) and a similar vintage Acrolite snare and you’ve got the makings of a killer studio kit. These tubs have that vintage warm woody tone. I couldn’t be happier! When I found out that Ludwig was going to be coming up with a ‘mini-kit’ I was certainly intrigued. I have a version of travel kit that I use A LOT around town and I really love it. I knew Ludwig’s kit was going to be similar but I still felt compelled to order one. Now that I have it and have it dialed in, I really am digging it a lot. It’s got a different quality to the other mini-kit I own, but still gives me the benefit of a small footprint and a great sound. The black sparkle finish is subtle and effective and the bass drum lift gets the kick off the ground for more thump. I can’t say as I sound anywhere near the man himself when I play this hotrod, but it sure inspires some fun breaks and grooves that I can dig into for hours. Paul Mason and I have known each other for a number of years. I remember the first time I decided to swing by his booth at NAMM some years ago. He had a lovely 4 piece kit on display and several snare drums. We talked for a few moments, he was very kind, and suggested I sit down at the kit. I hit the bass drum once. Once. I looked at him and said ‘Really? Even here in this convention center?’ You could just tell. The drums sounded great. Crisp but resonant. They felt good when you hit them. The sound translated wonderfully. I was sold. I bought this kit on a lark because I needed to leave something at a theatre for a gig I was doing. Little did I know this thing would be a monster. Don’t let the sizes fool you. This little gem is a great kit for the various small venues I play and it’s just a fun kick around kit that always sounds good. Far from a toy, this thing delivers the goods. Ludwig is now making something similar in the form of the Quest?Love Breakbeat kit (which I also own… see above). This drum set is in the process of being modified with a new finish (for those that love the brushed silver finish… I’m kind of over it… sorry…) I might do a blue glass glitter or perhaps a grey strata (harkening back to the classic Rogers finish from the 60’s). Stay tuned for pics once that all happens. Istanbul cymbals are dark and yet have a great amount of cut to them. I have loved pretty much everything I’ve heard from day one and am constantly amazed whenever I visit at the sheer amount of ideas in metal form they have to hit! Brilliant!!! I’m very pleased to be a part of the growing POPercussion family. I got my first cajon from Patric before he moved shop back over the Germany. Josh Day (Sara Bareilles) recommended I check this cajon out and I was blown away. I use the ‘Big Bass Box’ and it’s absolutely killer. Live and in the studio, engineers and sound guys love it. It speaks wonderfully and gives me the entire world of a kit in a portable package. This and a few shakers, some brushes, and tamborines for the feet and I’m ready for just about any kind around town gig or small touring situations. Plus, they’re a blast to play. These drums speak with authority. It’s like ‘Bonham in a box’. Patric’s build quality is unparallelled and he’s a wonderful guy. I became aware of this company and this drum through my friend Mike Meadows. He is not only a wonderful drummer, percussionist, hypnotist (seriously! ), and human being – he also is the creator of this amazing drum. It’s inspired by a Ghanaian Gombe (Gome) drum. It works like this. A 16″ drum head sits on a metal frame that is clamped down with a retaining ring. The body of the drum is made of any one of a number of woods (mine is carmelized bamboo), and the metal frame is attached to this body. You are able to adjust the tuning of the drum by way of a turn screw (like you would on an old tympani). You can achieve a variety of tones by adjusting the tuning. You can play this with your hands or any number of implements. You can also use a bass drum pedal (with your heel) to get bass tones happening. There are also panels you can purchase for either side of the drum to get more slap type tones (as you would on a cajon). It’s an ingenious instrument and it all fits in a standard 16×16 floor tom case. So, it (along with some assorted shakers, tambourines, bass drum pedal, implements, etc.) can all fit and clock in at under 50 lbs. It’s a great option when you are doing acoustic gigs in town or fly out dates (you’ve got a whole kit right there basically!) Mike did a wonderful job concocting it and Eric Holland (his partner at Black Swan) did a great job of designing it and working out the engineering kinks. This is a great drum! Bongos, tambourines, dumbeks, darboukas, djembes, shakers, log drums, udu drums, there’s a lot that goes into being a drummer today than just kit work. That said, I’ve also got a mountain of hand percussion gear that I’m often called on to bring out for overdub sessions, or to just give a different feel on a gig when an artist wants to do a little something different. Cross Crashers, Cross Benders, Celtic Bells – F.M.P. B-Band has really come up with an amazing idea based on acoustic guitar and bass pick-ups – tweak the frequency responses and create the same concept for drums. It works brilliantly and is very low profile so it doesn’t look like I have an erector set hanging off of my toms and snare drums. These are wonderfully designed and sound beautiful. I also use their cajon contact mic/pick-up and get a huge sound out of it. I am currently assembling a collection of electronics and recording gear and I’m excited about the new possibilities presented by use of these instruments.